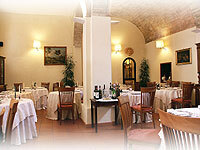 At the feet of the Park E.Fiumi, between the acropolis and the piazza dei Priori, in a building built partly in the XII century and partly in the XVI century, was born in 2001 the Restaurant-Wine cellar "Del Duca." according to seasons and availability of fresh products. In a corner of the garden is a barbeque. 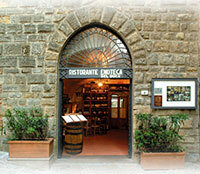 Every Wednesday takes place the Tuscan evening: ham and cold cuts, bruschette, soup and T-bone steaks on the grill. 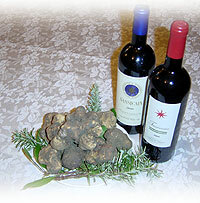 The kitchen is in the hands of chefs-owners Genuino Del Duca (also sommelier "Ais" and "Fisar") and Ivana Delli Compagni who besides rigorously respecting the tradition, create excellent dishes using fresh products rich in meats, vegetables, cold cuts, cheeses, mushrooms and white truffles. 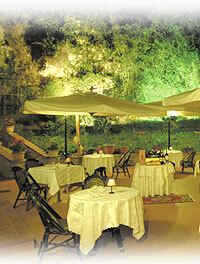 The garden, green oasis in the middle of the historical city, is in the restaurant courtyard, under the acropolis. A great and cool place during hot summer nights. Management and ownership: The Del Duca family deals with hospitality as a tradition. Experience, professionalism and quality are the strength of this management. 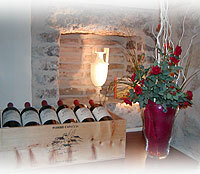 Restaurant - Wine cellar "Del Duca"